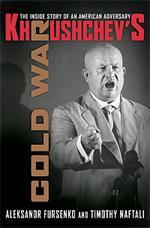 Aleksandr Fursenko and Timothy Naftali, Khrushchev’s Cold War (New York: Norton paperback, 2007), 670 pp. Überhawks carelessly toss around the Hitler comparison  Ho Chi Minh was Hitler. Slobodan Milosevic was Hitler. Saddam Hussein was Hitler. Now Mahmoud Ahmadinejad is Hitler. Yet it is nonsense to compare the leaders of small, poor, and underdeveloped Third World states to the dictator of the most populous, industrialized, and militarized state in the center of Europe. The argument that the U.S. is threatened with extinction by and running out of time to save the world from Iran would, in normal times, be a second-rate comedy routine at a third-rate nightclub. But this claim passes as sophisticated analysis from ivory tower neocons today. There was a time when the U.S. really did face a serious military threat: the Soviet Union in the Cold War. Moscow was more cautious than aggressive, but it possessed the means to destroy America. Of course, the U.S.S.R. also would have been vaporized in any nuclear exchange. Foreign policy decisions all around really mattered then. Joseph Stalin wasn’t Hitler. Stalin was Stalin, a monster who had murdered more people over more time than had Hitler. But who was Nikita Khrushchev, Stalin’s eventual successor? Aleksandr Fursenko and Timothy Naftali help answer that question in Khrushchev’s Cold War. Khrushchev was sui generis, neither Hitler nor Stalin. Sadly, American officials never understood him. Khrushchev was a clever peasant, dedicated to strengthening his nation’s economy and world position. He could terrorize along with the worst of Stalin’s lieutenants, but played a lead role in ending Stalinism after the mass murderer’s death. And Khrushchev wanted peace, not war. From then on, until Khrushchev’s fall from power in October 1963, Soviet policy bore his unmistakable imprint. The descriptions of Soviet decision-making, and particularly its relationship to and impact on American policy, make for a fascinating  if at times frightening  read. On several occasions, most notably the Cuban missile crisis, one U.S. or Soviet misstep could have led to catastrophe. The Western allies misunderstood Khrushchev from the start. They assumed he was likely to chill the Cold War. But he outmaneuvered Molotov, the true hard-liner, and withdrew Soviet troops from Austria. Khrushchev also wanted to improve relations with Yugoslavia’s Josef Broz Tito. Perhaps most significantly, Khrushchev engineered Presidium approval of a strategy of “peaceful coexistence” with the West. Of course, the mistaken assumptions were mutual. Khrushchev believed that a secret cabal of militarists was controlling U.S. policy. Moreover, Khrushchev’s preference for a civil relationship with America did not automatically make forging such a relationship easy. He sought to prevent West Germany’s accession to NATO and for years pressed the allies to abandon Berlin. He refused to accept the Eisenhower administration’s proposal for an “open skies” policy of mutual surveillance, which led to the downing of the U-2 spy plane and near rupture in relations between Washington and Moscow. Moreover, after relaxing the U.S.S.R.’s control over Eastern Europe, Khrushchev reversed course and bloodily suppressed rebellious Hungary. In other regions he assiduously worked to enhance Soviet influence at American expense, gaining in Egypt, Iraq, and Southeast Asia, for instance. But Khrushchev found his allies, such as Egypt’s Gamal Abdel Nasser, to be as difficult as America found its friends to be. Placing nuclear missiles in Cuba was Khrushchev’s most dangerous gambit. The course of that conflict is well-known, but it loses none of its suspense in the retelling. Although President Dwight Eisenhower often discounted Khrushchev’s threats, U.S. and allied restraint  such as when Washington forced an end to the Egyptian invasion  was interpreted by Khrushchev as evidence that his game of geopolitical chicken worked. According to Fursenko and Naftali, “Besides vindicating the risky policy that Khrushchev had been advocating in the Middle East since 1955, Nasser’s survival demonstrated the utility of the nuclear bluff for the weaker superpower in international politics. Now it seemed to Khrushchev that he had found in the nuclear bluff an effective way to weaken Soviet adversaries on the cheap.” Khrushchev made the same assessment of the confrontation over Iraq. Despite the Soviet Union’s manifest weakness, the Moscow leadership decided to box above their country’s weight, so to speak. But only to the edge. Khrushchev did not want war. In fact, for a time he cut military outlays to free up resources for the civilian economy. Of the period 1959 to 1960, observe Fursenko and Naftali, “Only with the release of the Kremlin leadership documents is it now possible to understand the extent to which Khrushchev tried to create an opportunity for reducing the level of international danger and limiting the enormous economic burdens of defense budgets. Not until Mikhail Gorbachev would a Soviet leader again initiate as bold an effort to end the Cold War.” Even the Cuban missile crisis was seen by Khrushchev as a means to force the allies to come to terms in Central Europe, and particularly Berlin. This period yields many a fascinating story. For instance, Khrushchev admitted to his colleagues that his nation was far behind the U.S.; he mused about following America’s example of the 22nd Amendment and setting term limits for Soviet officials. Economic failure belied his promise to catch up with America. Disputes over Berlin, Congo, Cuba, and Laos created constant, unpredictable confrontations. And then there was the Cuban missile crisis. Ultimately, Khrushchev’s reform program foundered on all counts. Disappointed in his failure to reach an accommodation with the West, he eventually revived repression and reemphasized the military, trends intensified by his successors. Unlike Stalin, however, Khrushchev’s power never was absolute. He sometimes faced opposition within the Presidium, which on occasion rebuffed his proposals. Indeed, in 1957 a majority on the Presidium voted to remove him, but he relied on the military and orchestrated a meeting of the Communist Party Central Committee, which supported him. In 1963 the conspirators, led by his own appointee, Leonid Brezhnev, enlisted the military and relieved him as General Secretary. He accepted the decision with surprising equanimity. Thus ended the tenure of the most colorful Soviet leader. A number of important, if prosaic, lessons shine through the Khrushchev experience five decades later. Ignorance about one’s adversaries leads to counterproductive, even disastrous, policies. Relying on one’s prejudices yields negative results. If a policy looks stupid  such as sending a spy plane over an opposing power in advance of a summit meeting with that country’s leader  it probably is stupid. Viewing everything everywhere as a vital interest risks war over trivia. And most fundamental: Few geopolitical objectives warrant taking the world to the brink of nuclear war. Khrushchev’s Cold War makes for an enjoyable historical journey, enlightening readers about a critical period of U.S.-Soviet relations. The book also poses a fascinating “what if.” Another two decades would pass before reform again entered the Kremlin lexicon, and the result then was the end not only of the Cold War, but the Soviet Union. Had Khrushchev survived in power, would international communism have ended sooner? Maybe he would have succeeded. Or maybe, as Fursenko and Naftali observe, a new incident would have triggered another confrontation and crisis. Despite his brutality, Khrushchev left a legacy filled with lost opportunities. It took another generation for a more humane and daring communist leader to complete the reform process begun by Khrushchev.